Freeman has long been the recognized one-stop shop for the modern patternmaker and foundryman. Whether you are machining or casting patterns, tools, fixtures, or molds, Freeman has the most complete line of materials and accessories for the job. The industry standard foundry pattern and tooling board, known for its outstanding wear resistance. Our newest foundry pattern and tooling board, offering easier cutting characteristcs than 5179. Our highly wear-resistant and impact-resistant semi-rigid polyurethanes, used extensively in casting foundry patterns and core boxes. 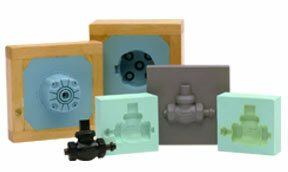 A large selection of brass, steel, aluminum, and nylon air release vents. Various seals for core box applications. Designed for positive registration of cope and drag halves, these buttons help eliminate mold shift. 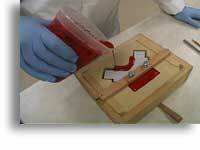 Metal embossing equipment and tapes for labeling equipment and identifying batch and heat codes. Leather, wood, and wax fillets and associated tools for creating radii on patterns and models.